Today, I look at the Rittenberry family and the life of Dora Effie Jane Chism Rittenberry Johnson of Tennessee. Dora Effie Jane Chism was one of the ten children of John Wesley and Charlotte (Clark) Chism. She was born 12 May 1888 in Putnam County, Tennessee and was the youngest of the three children of Charlotte living in 1900. Her older known living siblings were Amey and John Chism. The 1900 census reported that Charlotte had ten children only 3 of which were alive in 1900. The Chism surname is spelled in many different ways, Chism, Chisam, Chisem, and Chisholm in various documents. We also know that one of her sisters married an (unknown) Kinnaird and had two children, Kilmer and Clarence. She died before 1900, and her children are the grandchildren living with John Wesley and Charlotte in the 1900 Census. In 1902, when Effie, as she came to be known, was only 14 years old, she married 20-year-old, William Dee Rittenberry. They had eight children. All of their children have since passed. Through the years, the Rittenberry’s show up together in various locations in the area. In 1910 they were in Cookeville, Putnam County, in 1920 in Crawford, Overton County (about 30 miles away) and in 1930, back to Cookeville. Sometime in the 1920s, they lived in Algood, TN (about 5 miles from Cookeville). I have been unable to find the divorce record between Dee and Effie, but the gunfire exchange was probably reasonable grounds. I presume the divorce occurred sometime between August 1931 and March of 1940 because on 17 March 1940, Effie married Mike Johnson. Find Mike and Effie Johnson in the 1940 Census. 1900 Census (FS), Family Search, 1900 Census – John Chisem [Chism) – Putnam, Tennessee. John Chisem, wife, three children, and two grandchildren in the household.. https://familysearch.org/ark:/61903/1:1:MSCT-NBT. 1910 Census (A), Ancestry.com, William D Writtenberrg [Rittenberry] Cookeville, Putnam, Tennessee. 1920 Census (FS), Family Search, William D Rittenberry – Crawford, Overton, Tennessee, ED 65, Sheet 5A. https://familysearch.org/ark:/61903/1:1:MNP3-PXX. 1930 Census (FS), Family Search, 1930 Census – Dee Rittenberry – District 19, Putnam, Tennessee, ED 71-23, Sheet 2B. https://familysearch.org/ark:/61903/1:1:SPQR-745. 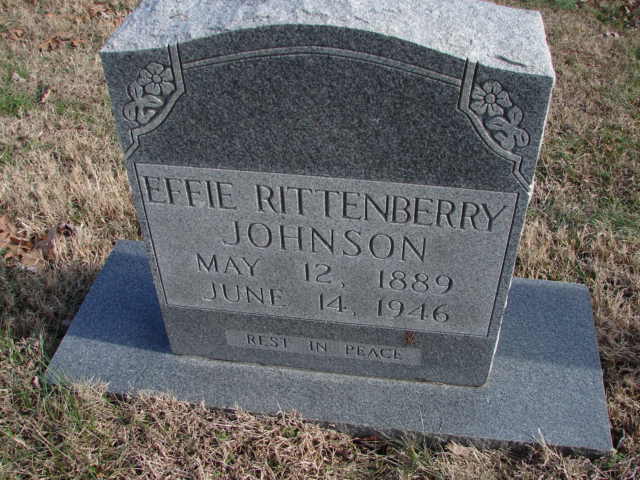 Find a Grave, Find a Grave, Effie Rittenberry Johnson. https://www.findagrave.com/cgi-bin/fg.cgi?page=gr&GRid=62864211. Herald-Citizen ((Cookeville, TN), ), Genealogy Bank, Mrs. Evelyn Stone – Obituary January 5, 2001. http://www.genealogybank.com/doc/obituaries/obit/14308AB9C4C9D480-14308AB9C4C9D480. Tennessee Death Records, 1914-1963, Family Search, Cecil Rose Rittenberry. “Tennessee Death Records, 1914-1963,” database with images, FamilySearch; citing Cemetery, Cookeville, Putnam, Tennessee, State Library and Archives, Nashville; FHL microfilm 2,137,360. https://familysearch.org/ark:/61903/1:1:NS7C-X5B. Tennessee, County Marriages, 1790-1950, Family Search, William Dee Rittenberry & Effie Chism. https://familysearch.org/ark:/61903/1:1:QKHQ-M4MZ. Tennessee, Death Records, 1914-1963, Family Search, T J Rittenberry. https://familysearch.org/ark:/61903/1:1:QKM9-LKMV. Tennessee, Deaths and Burials Index, 1874-1955, Ancestry.com, Dora Effie Johnson [Dora Effie Chism]. U.S., Social Security Applications and Claims Index, 1936-2007, Ancestry.com, William D Rittenberry Jr.
United States World War I Draft Registration Cards, 1917-1918, Family Search, William D Rittenberry. https://familysearch.org/ark:/61903/1:1:KZ6X-M4R. This is invaluable! Thanks from Lucille’s grandaughter!